5 Bananas: has a 'race to the top' begun? 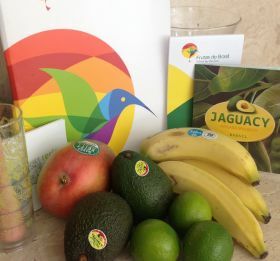 A selection of Brazil’s tropical fruit offer was showcased at this week’s Taste of London festival, the biannual celebration of the UK capital’s culinary scene. Visitors to the fair had the opportunity to sample a variety of fruits and recipes including guacamole, papaya cream and acai ice cream. Jorge da Souza of Brazilian fruit producer and exporter association Abrafrutas said the event was a great opportunity to promote Brazilian fruit in what is becoming an increasingly important market for exporters. “We are excited to be presenting our high quality, tasty and sustainably grown fruit here in London, he told Fruitnet. Created four years ago to galvanise Brazilian fruit exports and open a path into markets such as Asia and North America, Abrafrutas brings together 60 of the country’s biggest fruit producers under a unified brand, Frutas do Brasil. Brazil is the third largest fruit producer in the world behind China and India, but typically sells only a small proportion of its output on the international market and is often described as a sleeping giant because of the huge potential that exists to develop its horticultural exports. According to Apex-Brasil, fruit exports to the European Union – Brazil’s biggest market – reached US$649m in 2017, an increase of 13.5 per cent on the previous year’s total of US$573m. This means the country is well on its way to achieving its target of hitting US$1bn in fruit exports by 2020. “Fruit production plays a vital role in social inclusion and regional development, providing employment for rural communities and contributing to the sustainable growth of the economy as a whole,” da Souza continued. One of the biggest challenges Abrafrutas faces is tackling the highly fragmented nature of Brazilian production. Da Souza noted that organising themselves into regional associations would not only allow farmers to benefit from economies of scale but also give them a louder voice when it comes to lobbying the government. Inadequate cold chain and transport infrastructure and excessive red tape are two of the biggest obstacles to export growth. Brazil also lags some way behind regional competitors like Chile and Peru when it comes to negotiating trade agreements with other countries. Nevertheless, things are improving – albeit slowly. At the end of last year, the government announced an ambitious programme to stimulate fruit exports and exploit new opportunities in high value markets, the result of a joint initiative between the agriculture ministry and Abrafrutas. The Brazilian Fruit Development Plan (BFDP) will look at research and development, production systems, plant health, infrastructure and logistics, marketing, credit and risk mitigation and several other key areas in a bid to unlock the country’s export potential.